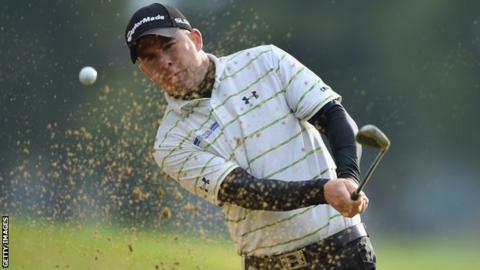 Richie Ramsay holds a one-shot lead going into the weekend at the European Masters in Switzerland. The Scot, who is 12 under, followed his opening-round 62 with a four-under 66. Welshman Jamie Donaldson is 11 under while his European Ryder Cup team-mates Victor Dubuisson of France and Denmark's defending champion Thomas Bjorn are eight under and two under. Northern Ireland's Darren Clarke, on par, was among those who missed the cut, which was set at one under. Italy's Edoardo Molinari, who was joint-overnight leader with Ramsay, has fallen back to tied for eighth with Dubuisson, Scotsman Marc Warren and English duo Seve Benson and Tommy Fleetwood. "I know how to deal with the nerves and the pressure and it's what we love"
Ramsay, who won the tournament in 2012, picked up five birdies and dropped just one shot in his second round. "It was tricky out there, it wasn't as cold as expected but the rain came in and that dropped the temperature," he said. "It was nice, tougher pins which makes scoring a little bit higher but I adapted well. A good short game on the first few holes has kept me on a nice even keel and kept the momentum going. "I picked up a few birdies at 15 and 16 [after starting on the back nine] which got the wheels going. "Four is always a tough hole and it was great to get the birdie back straight away [at the fifth after bogeying the fourth], that settled me down. "I've got a huge amount of experience around here, winning not just here but in any European Tour event is tough. "I know how to deal with the nerves and the pressure and it's what we love. The little bit of butterflies in the stomach and seeing how you react under pressure because I don't think there's anything better than playing well under the pressure to try to win a title."